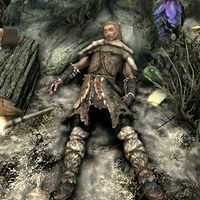 Hans is a dead Nord who can be found outside Myrwatch. His body lies next to an empty wine bottle, a woodcutter's axe, a still-lit torch, and Sindnar's Tower Notes. He was killed by wildlife while attempting to unseal the tower's entrance. He failed to figure out how to activate the seal, although his efforts will aid you during the related quest. He is wearing fur armor, fur bracers, and fur shoes. He carries two torches along with an iron dagger. His body can be looted for Hans's Journal and Spell Tome: Flames. His body disappears after the related quest.